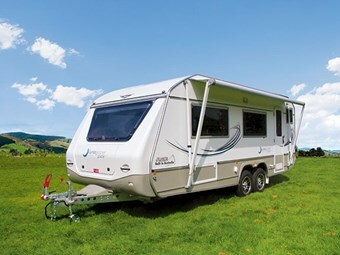 If you’re in the marketplace for a lightweight, mid-sized caravan, consider the nine layout options offered by Jurgens Lunagazer, Peta Stavelli writes. Trans-Tasman rivalry is everywhere — from the sports-field to the workplace. However, Jurgens is one Australian company taking a lead from its Kiwi counterparts through grassroots interaction with buyers at New Zealand motorhome shows. Taking on board their feedback, and that of their New Zealand agents, has resulted in numerous refinements. 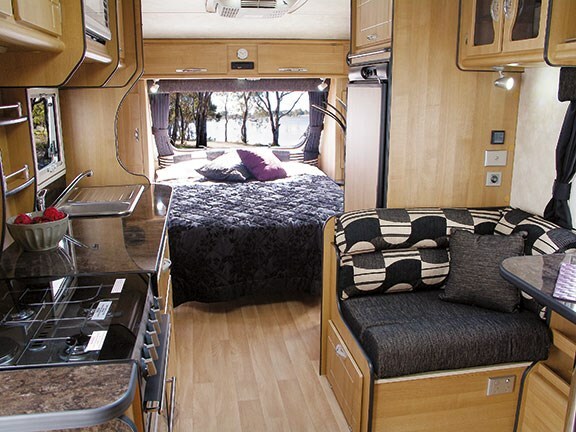 One is the design of a more generous entertainment area inside the vehicle to suit the Kiwi way of life. Another is the use of stainless steel screws throughout to improve longevity in our harsh maritime climate. Jurgens' development process involves 'torture testing' at an automotive proving ground which represents 100,000 kilometres of operation. The caravan is exposed to all kinds of operating conditions including corrugated roads, potholes, cobblestones and even water crossings. Vehicle performance information is collected to ensure long-term reliability and refine design. In previous reviews we've spoken of the tough tests caravans in the Jurgens' range have faced during the company's growth in South Africa, since 1952, and Australia, since 2008. These have enabled the manufacturers to make significant improvements in construction and the result is vehicles capable of withstanding harsh conditions. 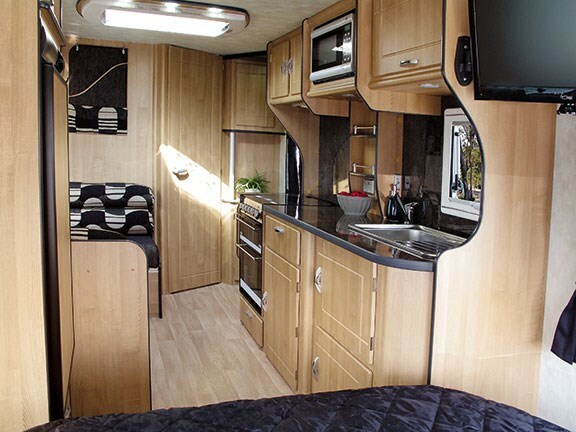 Jurgens caravans come standard with an attractive stippled exterior surface which is easy to clean and scratch resistant. The Uniskin (single panel) roof is designed to cut down on the likelihood of leaks. Similarly a one piece floor bonded to the chassis adds structural integrity. The manufacturer claims the Optima chassis is engineered to withstand forces well beyond normal operating and it's all backed by a three-year factory warranty. Make no mistake: these refinements don't stop at the exterior. The numerous interior layouts offer plenty of personal choice. Choose from a queen size bed with twin bunk, single beds with ensuite, or an ensuite with queen bed. The island bed has wardrobes either side and the extendable bed is on gas struts for easy access to storage underneath. 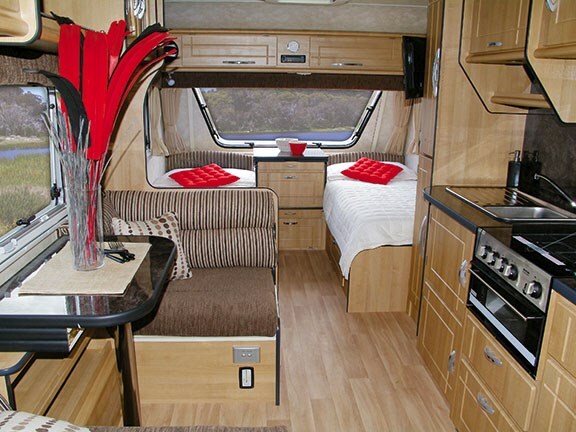 You may also choose from several dinette options including a café lounge or dinette which converts to either a double bed or single bed. 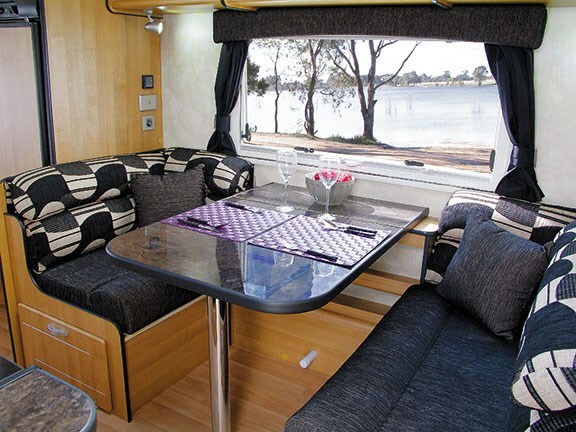 The vehicle we reviewed had a convivial café-style layout with a natty treble fold table and a double bed. Well-designed folding or sliding tables are a mark of the Jurgens range and underscore the clever refinements from this experienced manufacturer. In the same vein is the multiplicity of good storage options, essential when on the road. 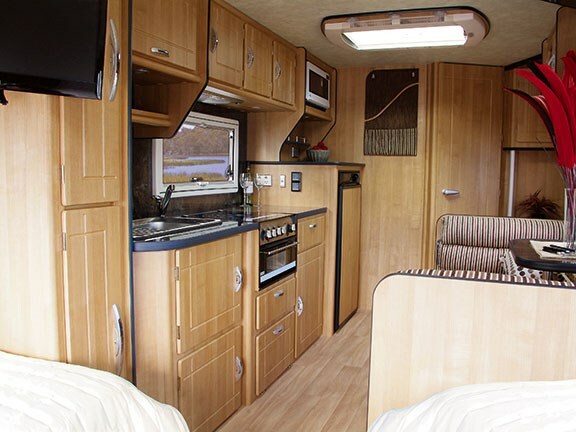 This vehicle came equipped with masses of overhead storage, concertina-style foldaway cupboards, storage under the bed and settee, as well as in the bathroom. The galley is generous with loads of bench space, a 164-litre three-way fridge and freezer, expel air and 23-litre microwave. The kitchen comes well-equipped with a six-person melamine crockery set and attractive glasses stored in glass-fronted cupboards. The stove top with grill has three gas burners and one electric with a 12-volt rangehood overhead. A fire extinguisher and smoke alarm are provided standard. A nice touch is an opening front window, which together with 700mm x 500mm hatch and reverse-cycle air conditioner takes care of temperature control. All windows come with screens blinds and curtains and the walls and roof are insulated. 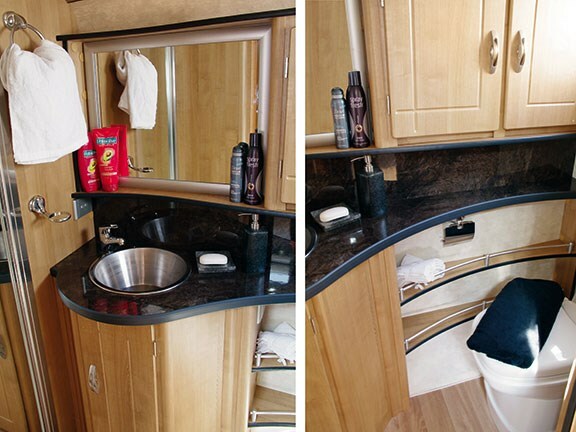 The full-length rear bathroom (if chosen) offers a shower, vanity and Thetford cassette toilet, with full length mirror. It's not a flash bathroom, although it is certainly adequate. Hot water is gas and 240 volt. Water storage is a 120-litre tank with handy gauge. The entertainment package includes a TV/DVD with antenna/booster and a radio/CD player. The 240-volt charger and 12-volt transformer complete the power system, along with two 4.5-litre gas bottles. External storage comprises a large, lockable, boot locker and another clever storage unit which provides external access to inside storage. Brilliant. A roll-out awning is lit with an annex light and the outside power point is an excellent idea. Worth noting are mag wheels as standard, together with electric brakes and independent suspension and anti-sway stabiliser — both by Alko. Upholstery is pleasantly colour-coordinated and all interior wall surfaces are washable. But for me this is one of the few drawbacks. I would love to see the frequently-used bland faux-wood surfaces employed by many manufacturers replaced with re-paintable, durable wood. However, this is a minor grievance. Overall, there is a great deal to admire in the Lunagazer J240, and the manufacturer has certainly achieved its main focus of creating a lightweight, functional vehicle able to be easily towed by the mid-sized family car.